Yesterday, I broke down Apple’s minute-long FaceTime commercial for iPhone 4, noting how it seemed almost as if Don Draper from the hit AMC show Mad Men had created it. 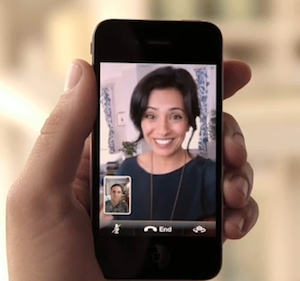 Now Apple has four other 30-second spots for the iPhone 4 that it has just put into rotation on national television. And yes, they’re all about FaceTime too. The four spots are titled, “Smile,” “Meet Her,” “Haircut,” and “Big News.” Each revolve around situations where FaceTime can dramatically improve what would normally be more traditional phone calls. They’re not quite as dramatic as the overall package of the longer original commercial (nor are they as good). But two of them still go straight for the heart strings. While the other two are more everyday conversations made better by video. “Smile” finds a girl talking to her father on the iPhone 4, but she refuses to smile. He finally starts singing, which makes her smile, and it reveals her new braces. “Meet Her” involves a son showing his father his new granddaughter for the first time. The grandfather gets choked up. “Haircut” has a girlfriend calling a boyfriend to show off her new short haircut. Rather than having to describe it, she can actually show it. The boyfriend agrees it is short, but loves it. “Big News” is the closest to the original one. In it, a wife calls a husband to give him some big news: she’s pregnant. It shouldn’t be too surprising that Apple is playing up FaceTime in each of its first five commercials — it is the easiest new feature to show off on the device. Apple’s new Retina display for the iPhone 4 is arguably more impressive, but it would be hard to show that off in a commercial without explaining it (and Apple seems to prefer to show rather than tell in these types of commercials). Still, I wouldn’t be surprised if in future iPhone 4 commercials, Apple figures out a way to show off the screen (something like, “wow, it’s like looking at a picture”), as well as show off the impressive build quality of the device, and perhaps the HD video taking capabilities. Find each of the new spots below.